1) Hypotension can occur especially with the intravenous form due to vasodilation and depressed myocardial performance. Long-term oral therapy can also cause depressed contractility but it is unusual. 2) Nausea can sometimes be seen during the loading phase. All we have to do is to decrease the daily dose of the medication. 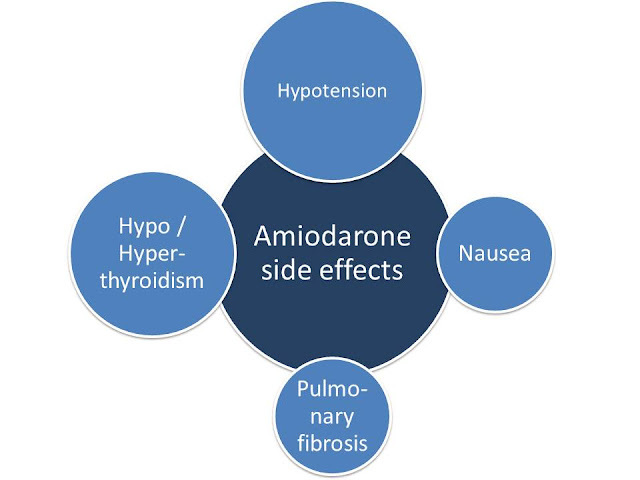 3) Pulmonary fibrosis is the most serious adverse effect during chronic amiodarone therapy. The fibrosis can be rapidly progressive and fatal. The risk factors include: underlying lung disease, doses of 400 mg/day or more and recent pulmonary insults such as pneumonia. Early amiodarone toxicity can be detected using pulmonary function tests and serial chest X-rays.